Leading cancer biologists and clinical researchers comprehensively review the latest basic research and its translational significance for the molecular biology and genetics of prostate cancer and its application in developing novel therapeutics. Highlights of recent molecular genetics research include new light on inactivated tumor suppressor genes, HPC families, the role of the androgen receptor, the progression of prostate cancer, and promising results from transcriptome profiling and proteomics. Research into the basic biology and regulatory mechanisms controlling prostate cancer growth and progression has revealed many new possibilities for therapeutic intervention, including cell adhesion molecules, the androgen receptor, use of the nuclear matrix, Caveolin-1, and the prostate-specific membrane antigen. 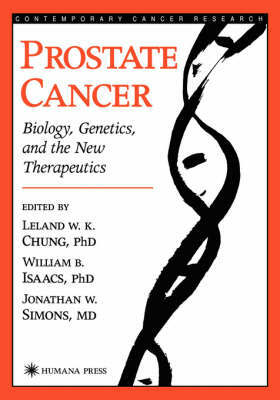 Comprehensive and cutting-edge, Prostate Cancer: Biology, Genetics, and the New Therapeutics synthesizes all the major recent work that is not only rapidly unraveling the mysteries of prostate cancer, but also dramatically improving today's therapeutic approaches.